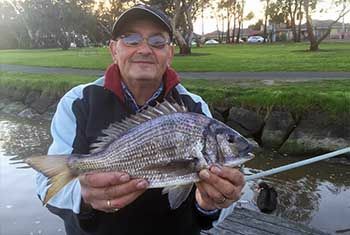 On Saturday morning John Regali was up to his usual tricks catching Bream in large numbers on the Maribrynong River between Essendon and Footscray. The water colour was very dark and murky from recent heavy rains but that certainly didn’t stop John from catching. The most productive method was fishing very light, regular berley and using Maggots and Pilchard as the go to baits. A huge well done to John who was also selected for catch of the week on Channel 31’s Talking Fishing. Well done John !! !